Redondo Beach Therapist: Beverly Scott - Therapist 90277. Send A Message To Beverly. Beverly Scott's journey to her passion in counseling others started with being the oldest girl in a large family. Beverly has continued to care for the youngest sister as her Conservator since her sister is developmentally disabled. Jobs have been Airline Stewardess, Wife, Mother, Grandmother, and Real Estate broker which led to an overriding passion for Psychological Counseling. Counseling has been her major job for over Twenty Years with a great deal of Psychological Trainings to her credit. 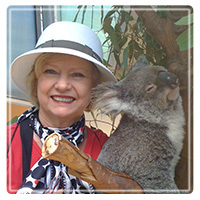 Beverly graduated from a California State University in 1990 with a Masters degree in Marriage Family Child Counseling. Beverly worked in Los Angeles Conciliation Court for two years working with Divorcing families and Child Custody arrangements finding ways to find better solutions for couples and then ways for families to stay together. Thus enter some major trainings and Certifications for Couples Therapy from the Masters in their field. Imago Therapy with Harville Hendrix, it's originator and Relational Life Therapy with Terry Real, again the Master to this therapy. Both of these therapists trainings help my clients to answer the question, "why are we together? "Taking responsibility for their actions is the beginning to the healing process. When counseling anyone in a relationship Beverly looks at what are the triggers involved when anger erupts and then what can be done about it. This is where the Trauma Therapy comes into play looking at their past to find out if there were prior incidents that may have caused them to react in a certain way. Then what can we do about a negative reaction to certain stimuli? This is where Beverly shines with her many years of trainings. If we as a nation are to have healthy children we must first have healthy parents to be their models. Beverly has learned from her own history and experience how important it is to have healthy Communication skills which are taught and practiced at each appointment in her office.With proper Communication skills Beverly's clients learn to have more Empathy, Insight, Awareness and enhanced Listening Skills. Beverly's Passion in life is teaching to others all she has learned in her many years of counseling experience. Beverly works well with all Addictions, Anger, Self Esteem issues, helps families with disabled family members and helps her clients have a more peaceful time in their later years of life. The time to work on issues is NOW because they don't get better unless issues are looked at and handled as soon as possible. As a single person or a couple I hope to see you in my beautiful office in Redondo Beach, California or by a handy media outlet.